I have a total love affair with London, I’ve lived here all my life and adore all the history it has to offer. One of the most iconic buildings in London would have to be St Paul’s Cathedral and it is also my favourite place to visit. To me it is the most beautiful and interesting building in the city. My favourite image of the cathedral would have to be the iconic photo ‘St Paul’s Survives’, taken after ‘The Second Great Fire of London’. This was the most ferocious night of the blitz in December 1940 in which the Germans dropped more than 24,000 high explosive bombs and 100,000 incendiary bombs on London in one night. 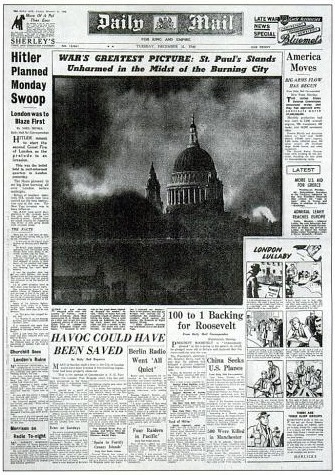 More than 160 Londoners died that night and over 1500 fires were started, however despite all the buildings around it being destroyed amazingly the most iconic building in London survived. Over 200 volunteers fought to extinguish small fires on the roof and a bomb even lodged in the dome. Winston Churchill had ordered that the cathedral be saved at all costs. 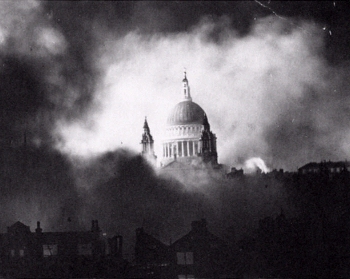 The survival of St Paul’s during the blitz is an iconic moment of the war and the photo has gone on to become one of the most famous images of The Second World War. The current cathedral was built between 1675 and 1720 after the previous cathedral was destroyed during the first Great Fire of London in 1666. 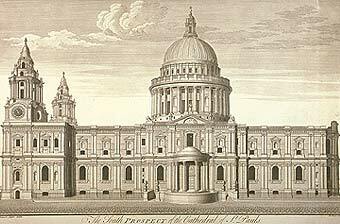 It is designed by Sir Christopher Wren who is well known for designing many of London’s buildings and churches after the fire as well as The Royal Naval College in Greenwich and the South Front at Hampton Court. The Cathedral was the tallest building in London until 1962 and it still has one of the highest domes in the world. It is the second largest church in Britain second only to Liverpool Cathedral which was completed during the 1970s. Many iconic London events have taken place there including the funerals of British heroes such as Nelson, The Duke of Wellington and Winston Churchill. The wedding of Charles and Diana took place there as well as jubilee celebrations for both Queen Victoria and Elizabeth. The church still holds daily services and I would definitely recommend attending one. I recently went to a sung service and the choir was absolutely amazing. It is the most beautiful place to sit for a while and have a rest from the hustle and bustle of the city. In non service times it can be quite busy with tourists however during services it is free to enter and you get a real feel that this is still a working church. There is also a small garden around the cathedral known as St Paul’s Churchyard and it’s a lovely place to sit a while and enjoy a quiet moment. Whether you’re a born and bred Londoner or just a visitor to the city this would definitely be a visit not to miss, and if you’re not as terrified of heights as I am I hear the view are amazing from the top of the dome. To find out more about The Second Great Fire of London and the way St Paul’s was saved I’d really recommend watching Blitz: London’s Fire Storm on 4od it’s an absolutely brilliant documentary with lot’s of brilliant re-enactment of the nights events. You have a beautiful city. I plan to visit it some day. Many of my friends have and they rave about it. You must see London! It really is an amazing place. – The people can be a bit grumpy though! It is such a magnificent building! In 1999 I was in London with friends, and there was a huge crowd outside St. Paul’s. We asked, and it seems as if the Queen Mum was attending a service. So we joined the crowd, and soon she emerged, dressed in lavender from head to toe. She slowly worked her way down the steps, stopping to speak to each of the choirboys who had lined up. It was probably the highlight of that trip, especially knowing how she was so important to the morale in London during the Blitz. Wow! That’s amazing. She really was a very interesting person who saw so much in her lifetime.